This is for technical support only. For general questions please contact APEGS directly at apegs@apegs.ca. 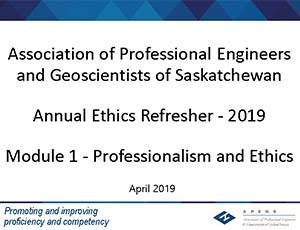 This one hour course is designed to fulfill the annual, verifiable ethics refresher requirement that is part of the APEGS’ CPD Program. This course examines the fundamentals of professional self-regulation, the value of licensure and the APEGS’ Code of Ethics. It concludes with some interesting ethical case studies. NOTE – APEGS acknowledges that there is a reference error in the presentation of the Bre-X Minerals Case Study. “CSA” was mistakenly cited as the Canadian Standards Association. It should be the Canadian Securities Administrators.